If you and your partner both work at home, you are part of an ever-expanding number. Personally, I can think of four families who have recently, and rather abruptly, had a spouse join the other in coming home to work. One of the couples lives in a beautiful four-bedroom lakefront home in which there are separate offices for the wife and husband. She is a real estate agent. Her office is on the main floor in a sunny room in the front of the house, where she has a large desk, bookshelves, filing cabinets and all the tools and accessories you might need or want in an office. The husband was, until a few months, ago primarily on the road. He worked at home only a few hours a month and instead of working in his small and dark office on the lower level, he tended to spread out on the dining room table or the kitchen island. They were both delighted when he began working at home, and yet it was a big adjustment. Making another workspace for him became a priority when she realized it was stressful having him commandeer the kitchen every single day. While it wasn’t ideal for him, it was preferable to being holed up in “the dungeon,” as he called it. Their solution was as simple as swapping his office in the small, dark bedroom for one in the larger and sunnier guest bedroom overlooking the lake. Now both have spacious, functional and pleasing workspaces that are, most important, separate. 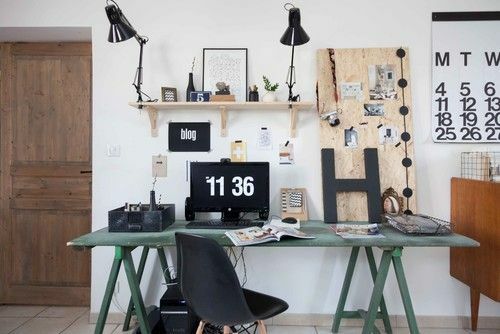 While Houzz is full of wonderful multiperson offices, working in the same room may not be the best choice for many people. To decide if it’s a good option for you, first make an honest assessment of your working styles. Do you like to work in silence or listen to music? Will you need to take phone calls or have video conferences? Are you neat? These three questions -- let’s face it, the first question alone -- could make it clear that creating separate workspaces is imperative. Unfortunately, though, not everyone has the luxury of empty rooms just waiting to be transformed. Another couple I know had a similar situation. The wife, a freelance writer, had an office set up in a room off their kitchen that could have been a dining room or den. The husband, a user experience designer, started a new job that required him to work remotely. They didn’t have an extra bedroom to turn into a separate office for him, and sharing hers was not an option. She needs total silence to work, and he likes to listen to music. He also needed privacy to talk to clients on the phone or video chat. 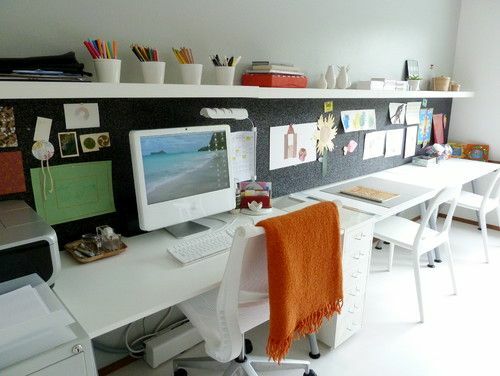 Since she frequently writes at a local coffee shop and works part-time, they decided to move him into the existing office and create another one for her in their unfinished basement. What actually happened was that her things sat in a corner of the basement while she worked at the kitchen table or on the sofa or at the coffee shop all last winter and spring. This past summer she went away to a weekend conference and came home to a new office. Her husband set up her desk in the basement near the egress window. He bought a rug, moved a bookshelf downstairs and unpacked all of her books, moved over a drawer file and installed daylight bulbs in a couple shop lights which he carefully placed to maximize light. In the beginning, moving down to the basement was a kindness on the wife’s part, but she has been surprised by how much she likes it. One of the unexpected benefits is that she isn’t distracted by laundry or kitchen chores. Here’s another basement corner transformed by a homeowner, who used a clever mix of very basic pieces as well as attractive and stylish ones. Two folding tables offer a lot of workspace and have a surprisingly appealing look. A coat of paint, an armoire and a buffet pulled in for storage, and some thoughtful styling go a long way toward making a practical and pleasing space in which to work. Of course, not everyone has the luxury of space even an unfinished basement affords. 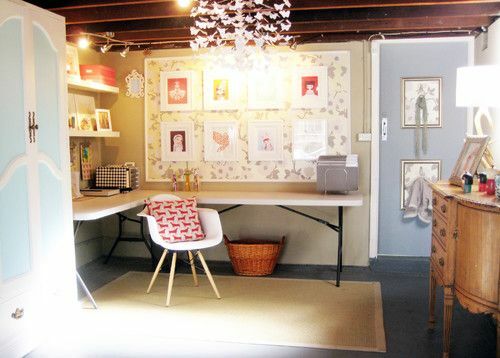 If you are trying to squeeze a second office into an already crowded home, you’re going to need to think creatively. Look around for any extra space, no matter how small. Here a glorified hall has been transformed into a beautiful, light-filled workspace for, in this case, two. If you are handy or have the funds to renovate, consider using the room under the stairs. If you are tight on space, the term “underused closet” is probably a joke, but really look at your belongings and decide what you can get rid of or what you can store someplace else. How about the corner of a kitchen? 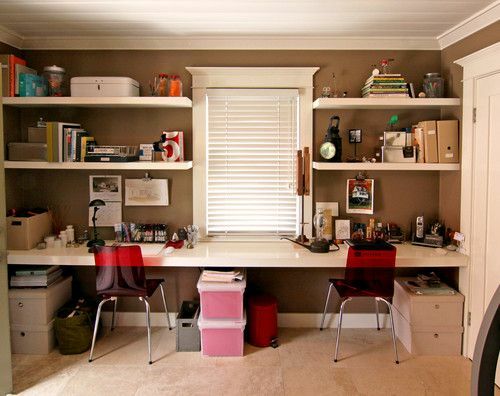 The cupboards above and beside are natural spots for stashing any files or other work clutter. 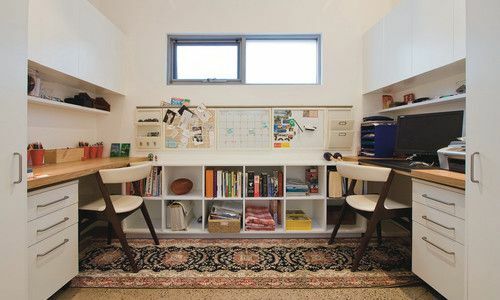 Even a tiny nook outside a bedroom is a possible work spot. Here shelves or a cabinet could be added above for storage.